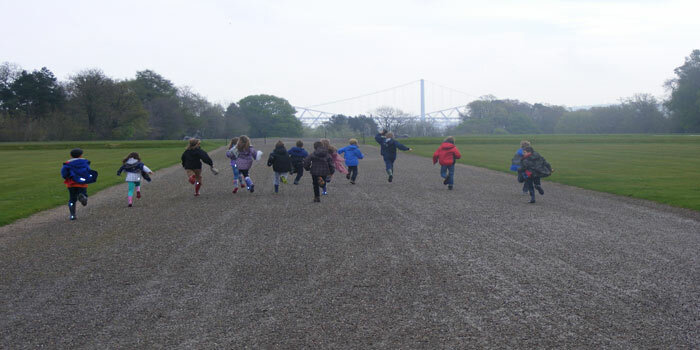 Here at Hopetoun we welcome our Young Visitors to come and explore Hopetoun through a range of different events and activities. There really is something for all ages. Follow Children’s Trails in House – Head to the Front Hall and ask one of our guides for the Children’s trail, a great way for children to explore the house. Why not dress up and work as a servant in the Butler’s Pantry? After you have visited the Roof Top Terrace head down the stairs and you will find out Butler’s Pantry, filled with historic costumes and old fashioned utensils for your child to have a shot at. Visit the Ranger Centre, for games, the big Hopetoun bug hunt, colouring sheets, interactive displays and the chance to handle wildlife finds from the grounds. Our Stables Kitchen has a special Children’s Afternoon Tea for your children to enjoy. Stacked with jam, cheese and ham sandwiches, a stack of mini pancakes with layers of cream & jam, along with a selection of sweet treats. Served with a glass of sparkling elderflower bubbly, hot chocolate or orange juice. Geocaching is a global treasure hunt, with thousands of caches hidden all over the world for you to explore and find with a GPS enabled device. Hopetoun has one Geocaching trail- the Hopetoun Hop. For those already familiar with Geocaching, download the Hopetoun Hop or visit the Geocaching website for more information. Hopetoun has its very own permanent Orienteering course. If you fancy something a little different whilst visiting the grounds, you can pick up a map pack from the ticket Kiosk for £2 and enjoy the thrill of Orienteering around the grounds of Scotland’s finest stately home. The course is designed in such a way that lets you explore all 100 acres of the grounds at Hopetoun, with controls situated from the North Deer park overlooking the forth, to the Southern edge of the Spring Garden giving you an energy filled visit. The Edinburgh Southern Orienteering Club helped to install and maintain the course and run meets at Hopetoun and other locations throughout the year. For more information on Orienteering, please visit their website. Hopetoun Junior Rangers is a fun, outdoors club for 11-18 year olds with an interest in nature and the countryside. This is an exciting outdoor based club for 7-12 year olds with a keen interest in nature and the outdoors, whatever the weather. Each session has a different theme ranging from den building and bushcraft, exploring and looking after the local wildlife, to treasure hunting. With a good variety of hands-on activities and crafts, mixed with healthy fresh air, it’s a fun and sociable group for primary aged children. If this sounds like fun, why not have a look at the Hopetoun Explorer Programme 2018. The Grounds at Hopetoun are the perfect place to watch and enjoy wildlife. From quiet woodland corners to the beautiful spring garden, there is something to look out for throughout the year. For more information on our Grounds Map and Nature Trails please visit Grounds and Wildlife.